17 Mar 2018, 12:30 p.m.
As the post-mortem begins into the slow suffocation Hackney endured at the hands of promotion-chasing Harpenden, analysts will pore over the statistics (is that a 0% captaincy win ratio?) and historians will trawl through the annals (how did the Ellingham game go? 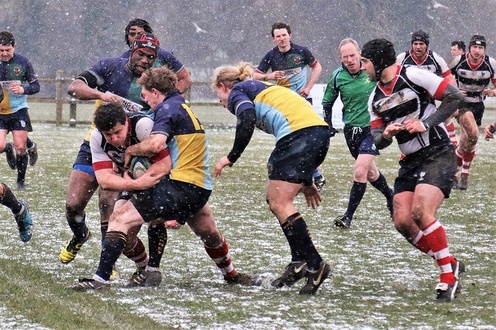 ), but two headline observations will surely emerge from Saturday’s rugby fare: it was snowing, and it was cold. On a day of frantic ‘is the game on or off?’ WhatsApp messages, rigor mortis felt that it had set in long before the final whistle, but despite the conditions this was a Hackney side that battled to the last visible breath. Following November’s corresponding fixture, the Griffins were keen to avoid a Harpenden whitewash, but were greeted with one of a different kind as they arrived in rural Hertfordshire. Selection had proved tricky during the week as a number of players were unavailable, having opted for quality time with the missus, wedding preparation or trips to Twickenham. Such was the availability crisis that your editor was even asked to captain the side. But as the teams emerged to a cacophony of excessively loud PA music and polite applause from the locals, there was a sense that the Hackney boys were up for it. The visitors certainly had a good share of the open play, and looked better once they were able to raise the tempo. But with a dominant home set piece that yielded two pushover scrums and a penalty try, as well as a series of exhausting driving mauls (for the pack at least), a tiring Hackney were unable to secure any territory or sustained possession. Heading into the sheds at 12-0 down, which was a mistake given how cold it then felt when we ventured back outside, Hackney had defended well but were keen to offer more threat in attack. And threaten they did, as Matt Strong, Dave Akkersdyke and the Hackney pack put aside their ice skates and began to find space around the fringes (the former being upended by a Gary Neville style two footer at one stage), and after a series of punching runs one lazy gate defender let Hackney through for a deserved score. That proved to be the highlight of the day however, as more scrum punishment was dished out and Harpenden closed out the game with a flowing counter attack try started by their lively full back. The post-match boat race was a closer affair, but due to a poor third leg (can’t remember who it was) the race was lost and Harpenden took a clean sweep. So a tough day all round, but Hackney could head south with heads held high and look towards a potential top half finish with three games to go.